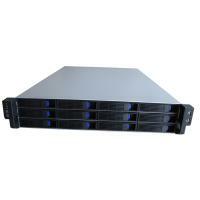 TGC-2312 is an industrial-quality 2U server chassis suitable for 19" server cabinet with 650mm deep or greater. This chassis comes with 12 Hot-swap HDD drive bays (Mini SAS) and 2 x USB2.0 port on the front panel. Supports up to EEB (12" x 13") motherboard. It is equipped with 4 x mid-mounted 80mm cooling fans for ventilation as standard.